I am sure that all people love to have their little nest or place where they like to rest and have a cup of coffee or eat a delicious meal. However, all of these activities are, apart from being relaxing, a bit messy, if we are being honest. But that’s understandable when creating something, especially cooking meals and serving beverages, things tend to get messy and occasionally you leave your kitchen in worse shape than you have found it. The key in this situation is the ability to find a way how to improve the situation and tidiness of your place. We all know that chores can be exhausting and boring sometimes, nonetheless, they are an absolute necessity to create a healthy environment to live in. There are several activities which can help you improve the situation, from dusting, window cleaning all the way to vacuuming, but today I will be mostly focused on the floor issue, namely the floor itself. And don’t get me wrong, it can be whichever floor in your apartment, not only the kitchen, but I would say that the kitchen space is most likely to absorb all the by-products of our culinary experiments. There are of course several ways how to tackle this issue and keep your floors clean, for example, you could go for the old-fashioned manual way, use a classic mob together with a bucket or try a more modern approach in the form of a steam mop. In the effort to stay up to date with the newest technologies I will give you an insight into the world and market offer of steam mops. Some say that this particular tool is the most effective one, others prefer more traditional equipment, either way, I will take you on a ride and explain the advantages of the steam option and show you the best products which are currently available. It might take some time to see which steam setting is the correct one for your needs. So please sit back and enjoy the overview of the finest and best steam mops. The first entry on my list of the best floor steam cleaners is the Bissell PowerFresh, which is one of the two Bissell products you will find in this review. 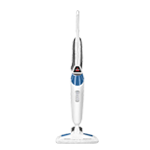 The cleaning and sanitizing quality of this mop is a big advantage since it destroys 99.9% of germs and bacteria thanks to the steam technique, plus all without the use of chemicals. If you encounter sticky and tough stains, don’t worry, the easy-to-operate scrubber brush is ready to give you a hand. The digital steam control will help you choose either the high, medium or low steam output, so you can adjust according to your present situation. Having a swivel steering mechanism and power core included gives you a chance to start the cleaning process in less than a minute. In the package, you will find a microfiber soft pad, scrubby pad, fragrance discs, which will leave a pleasant after scent, and a carpet glider. Be sure to use all the equipment at your disposal to achieve the maximum result. 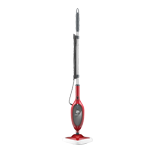 Even during long usage or frequent cleaning, the mop does not leak. Super easy use thanks to detachable parts and simple, but an effective reservoir. Works exceptionally well in the kitchen and bathroom. It might take some time to see which steam setting is the correct one for your needs. The more steam you use on an area the more time it needs to dry out. The main asset of this home steam cleaner is, apart from its dimensions, the ability to transform water into a cleaning force. Well, the water is turned into heated steam which is able to eliminate dirt and grime from your floor. 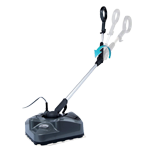 In fact, this steam cleaner can be used on a variety of surfaces, such as wood, tile, linoleum, and vinyl. The cord and its release systems are a plus in terms of operation. The entire heating process and the subsequent steam production doesn’t take more than a half minute and after application dries within a matter of seconds. Germs and bacteria don’t stand a chance against the sanitization power of the SharkNinja. Included you will find two microfiber pads which can be washed, and therefore, put an end to water mops and buckets. An easy-to-hold and ergonomic design of the handle ensures that you don’t get tired using the steam mop and simplifies the movement with the device. Very simple to operate and handle. It can last long with the correct approach to maintenance. 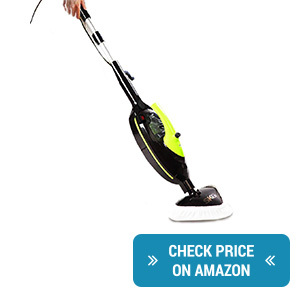 Cleans the floors nicely and is easy to assemble. Be very careful when choosing water since hard water can cause damage to individual parts and eventually break the device. Follow the manufacturer’s advice and use distilled water. Thirdly, I have chosen the LIGHT ‘N’ EASY floor steamer which doesn’t treat just floor surfaces. In reality, it’s a 5-in-1 cleaning solution which can be used to clean your entire house. Quick and easy. It’s also possible to use it in more difficult areas, thanks to the hand-held built-in option and flexible hose. 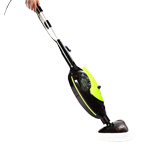 This device will help you clean your floor, carpet, garment, windows, mirrors and many more. Thanks to the unique use of steam you will be able to treat almost every surface. As far as sanitization is concerned, you don’t have to worry, the high temperature used to create the steam removes germs and bacteria without any use of chemicals. However, please pay special attention to detergents, which should not be introduced into the water tank before cleaning. This steam mop is super easy to use and maneuver, plus you can choose from one of the three steam level modes, which can be important in the case of floor finishes. The amount of time one full tank grants you depends on the settings you choose, but it can be always refilled with tap water again. A great help in the household which simplifies your cleaning routine. The mop is very quick to create steam when started up. Lightweight and easy to use, plus it does not make any sound even when it’s set on the highest level. Surfaces that are not that smooth might require a bit of strength when cleaning. The SKG is high-performance floor steam cleaner which can be easily put among the best steam mops currently available on the market. The sanitization and cleanliness achieved by this mop will certainly meet your needs and in addition, it’s chemical free, so for cleaning you only use water. It’s suitable for a home with babies or pets. This steam-powered cleaner will help you get rid of stains, dirt and other spots while simultaneously removing 99% of germs and bacteria. However, it isn’t exclusively a floor cleaner; on the contrary, you can treat several areas with it, such as your carpet with the help of a glider or your bathroom tiles. Thanks to the specific design you will be able to reach most of your corners. The intensity of your cleaning session can be simply regulated by selecting one of the four options (min, low, high, max). The accessories in the basic package consist of 3 microfiber pads which can be reused and also washed. 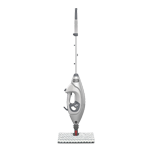 There are also several security features present in this steam mop device, for example, when the mop operates normally you will hear a beeping sound, however, once the water is running out, the sound becomes louder which signalizes the need for a refill. Plus, you will always know the machine is running, because it produces sound. The steam created by the mop is very strong and thus needs to be applied with caution. On the other hand, it really cleans stains. Great and simple assembly as well as instructions for use. You will be able to operate it in no time. This device gives you plenty of options in terms of house cleaning and can be used on multiple surfaces. The water container is a little bit small and therefore, requires frequent refills. The second SharkNinja on my list is a home steam cleaner with similar sanitizing qualities as the previous one, and this can also be used for floors and it features dual-sided pads which can be washed in a washing machine and are therefore created for multiple usages. Moreover, thanks to the touch-free technology you won’t have to touch the pads yourself. As far as the actual cleaning performance is concerned, the steam blaster eliminates sticky stains, greasy spots and stuck pieces. These are obviously different cleaning challenges and every one of them needs a separate approach. 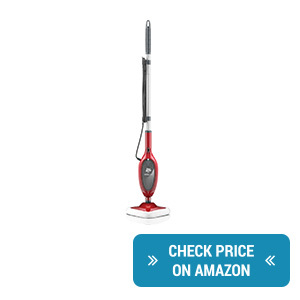 Thankfully, the Intelligent Steam Control lets you choose the amount of steam that will come out of your mop. No issues during the assembly process plus it is comfortable to use. The three settings you can choose from are a terrific way of dividing cleaning challenges. The pad release lever is a nice touch and the overall design of the product gives you an advantage when cleaning. Be sure to stay in motion because the powerful steam can leave marks if you forget to move the mop. This next floor steamer is using some intelligent mechanics that might leave you impressed. For example, the release of steam is carried out by a smart sensor which means that the more you move the mop, and the quicker you do it, the more steam comes out. We all know that feeling when you want to get rid of a tough stain or spot and it just doesn’t work. Well, with this feature it will soon be a forgotten issue. Next up, the handle. Its ergonomic design is a tremendous plus mainly in situations when you want to get to almost unreachable places such as the narrow cabinet or furniture spaces which we know all too well. The entire cleaning process is managed without any additives, it’s enough to use clean tap water to achieve top-notch results, plus there are no harmful fumes in your household. If you have carpets in your apartment you will have to additionally buy a carpet glider to place under the mop pad, but the results will speak for themselves. The design of the mop head fits nicely into narrow spaces. An overall light product which could be operated by an older person as well. No additional equipment is needed for basic cleaning and the water heats up relatively quickly. You should change pads quite often to avoid streaks. 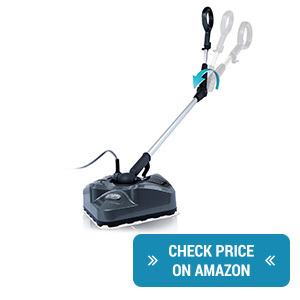 This Bissell floor steamer has two specific qualities. With this device, you will be able to vacuum and steam the floors at the same time, which will effectively save your time. Furthermore, the steam fulfills a sanitizing function as well and removes 99.9% of bacteria and germs commonly found in the household. There are many surfaces you can use this helper on, it doesn’t matter if you have hardwood, tile, ceramic or marble floors, the Symphony Vac and Steam will handle them all. The usage is fairly simple, intuitive and the new design choices such as the digital touch controls or the adjustable handle of the mop will ensure comfort during your chores. Included you will find 4 mop pads and a storage container in the form of a Quick-Release Mop Pad Tray. Thanks to advanced technology the tank will stay dry even though you will be steaming your floors. 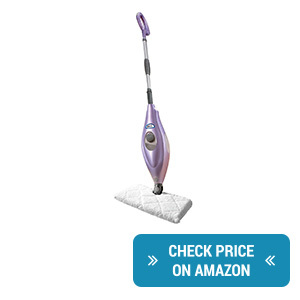 Comparable with the best steam mops, this product can be ready to use in no more than 30 seconds. In case you encounter any issues during the operation, feel free to consult the manual. 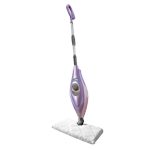 The mop needs little water to create steam and thus protects even surface which is more sensitive, plus it dries quickly. It is easy to clean thanks to the water which comes into the cleaning process. 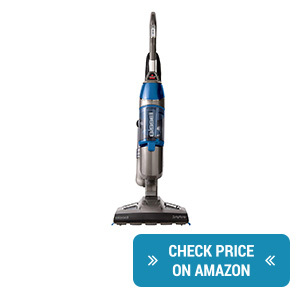 It offers you a vacuum option as well. Be sure to check the filter before every usage since from time to time it can be slightly dislodged. It’s true that most of the time we are preoccupied with floor cleaning and how the steam technology can be used on this part of your house. However, this following product can be easily used as a pocket mop and can become your home steam cleaner number one in no time. 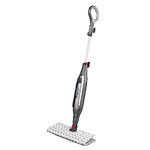 Since it can be used as a hand-held device you will have no problem cleaning areas above the floor as well. And let’s be honest, there are some spaces and surfaces which would definitely benefit from a steam cleaning. This steam mop has the latest technologies included and with its intelligent mechanisms, you will be able to replace pads without a touch. In addition, the pads are able to absorb dirt from both sides. As far as the intensity is concerned, you can choose one of the three levels to either remove dust, mop the surface or use real power for tougher stains which need scrubbing. 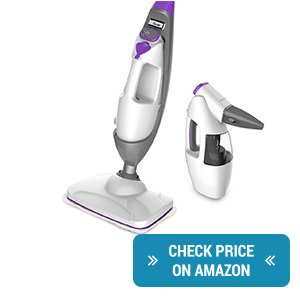 A very good steam cleaner option for the floors, but also for smaller spaces thanks to the hand-held version. Easy to store and use. 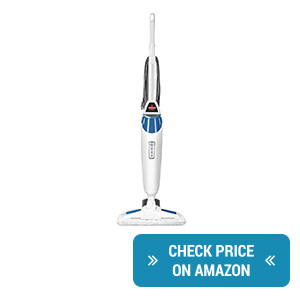 Great performance, plus it cleans the floors thoroughly. The control over the steam settings in the hand-held version lacks in comparison to the fully assembled mop version of this product. The last entry on my list is the Dirt Devil which represents a terrific version of hand-held and detachable steam cleaner that you can use without restrictions. You can always have a steam mop at your disposal. The maneuvering mechanics used in this model ensure that you will be able to reach corners and even go under furniture to keep your home perfectly clean, plus as mentioned earlier, you can remove the handle, which is always welcomed in narrow spaces. This ability is also complemented by the design of the device which makes it even easier. Moreover, if you have a carpet, the Carpet Glide Attachment can breathe new life into your dusty companion and lighten up the room. In terms of maintenance, the microfiber scrubbing pads are washable, so you don’t have to worry in this aspect, their cleaning is basically effortless. 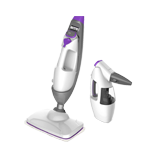 This steam cleaner has a smaller head than before which gives it additional movability and the ability to get to trickier places. Pretty lightweight and easy to use. 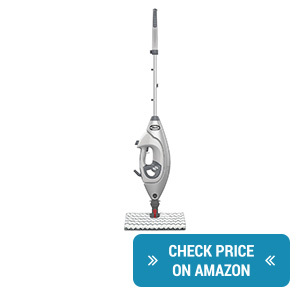 If you need to take financial aspects into consideration, this might be the budget version of a steam mop for you. If you have a bigger area to cover, you will often have to refill the water tank. If you have made it to this last section, that means that you have read my collection of the 9 best steam mops that are currently available on the market. I know that you might feel a little bit overwhelmed and maybe drown in information and that’s why I will simplify things for you and do a little summary. 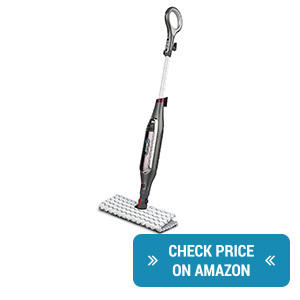 What are the things I look for in a steam mop? Well, that is an excellent question which should be asked and answered before you buy a steam mop. To be honest, it all depends on you, your situation and needs. For example, if you live in an apartment with narrow spaces and exclusively wooden floors you might consider putting these aspects to the top of your list. All of these steam cleaners are suitable for several surfaces, be it wood, tile, ceramics, or even marble, but you should certainly investigate more and combine it with other qualities as well. Another element which is often crucial in apartments, and houses as well, is space. Not only the requirement of storage space, to which you can also find a great solution among the products above, but also the spaces you actually want to clean. Some design pieces are better suited for a more specific cleaning job, while others have a range that could rival one of the vacuum cleaners. Several pieces are even handheld, which then gives you the opportunity to move freely and be more detail-oriented. As far as the health aspect is concerned, practically all of these steam mops rank among the most effective ones in the battle against bacteria and germs, so sanitization isn’t really an issue here. I know that in some cases this might be the most sensitive subject but believe me that hot steam and its power is extraordinarily efficient and can keep your home safe and clean. And since they only use clean water for cleaning, no additional chemicals will have to be used in the process, creating a safe environment for kids. From an equipment point of view, the majority of steam cleaners use pads that are included in the package, and some of them even have a special no-hand mechanism to get rid of the used ones. Moreover, they are all washable and reusable which is great for your household as well as the environment. 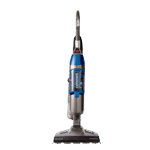 Furthermore, there are add-ons and additional gear you can buy to either boost the cleaning attributes or adjust the steam mop for a specific surface. So, there you have it, feel free to revisit the information once more and consider all the elements in order to choose the best steam mop that will fit your needs.